A week after Saturday Night Live's Pete Davidson misfired a joke at Texas Republican Dan Crenshaw, SNL gave Crenshaw an on-air apology and a chance to crack some jokes about Davidson. 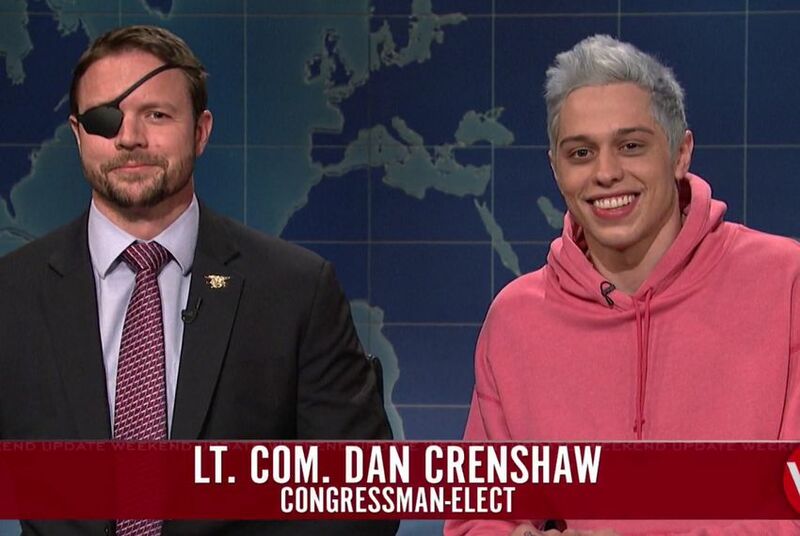 Dan Crenshaw, a Texas congressman-elect who was the target of a badly received joke on Saturday Night Live last week, got a payback opportunity this week, appearing on the show to take some pokes at SNL cast member Pete Davidson. On Saturday night’s Weekend Update, the hosts introduced Davidson, who apologized for a joke he told about Crenshaw last week. And then Davidson introduced Crenshaw, who was sitting next to him, and gave him the floor. Crenshaw accepted Davidson’s apology, and Davidson gave him a chance to get even. During the exchange, Crenshaw’s phone rang, with a ring tone from Ariana Grande, who until recently was Davidson’s fiance. “Do you know her?” Crenshaw asked. Last week, Davidson mentioned Crenshaw in a segment during Weekend Update next to a photo of Crenshaw, who wears an eye patch because of an injury caused by an IED blast during a mission in Afghanistan. Crenshaw was a member of SEAL Team Three and served five military deployments. Crenshaw won election on Tuesday night to succeed U.S. Rep. Ted Poe, R-Houston. He’ll take office in January.